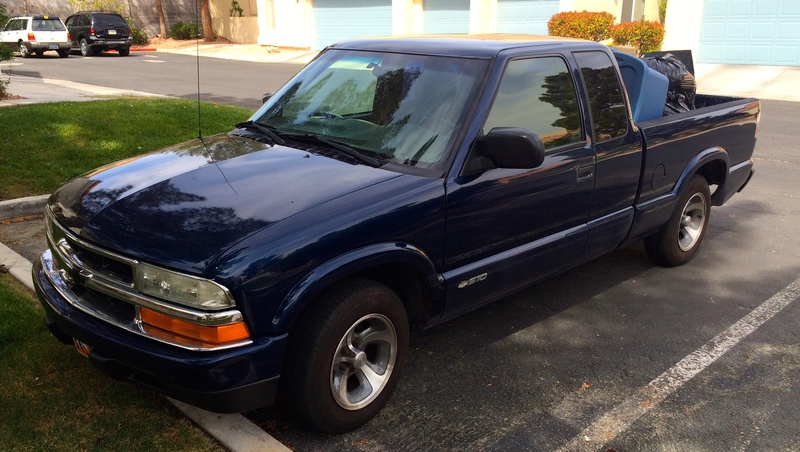 In Arizona, Does 2003 Chevy Truck Mean “Mexican Drug Runner”? Driving along Interstate 15 the other night in my 2003 Chevrolet S10 pickup, laden down with furniture and household belongings, I was pulled out of a line of traffic slowly wending its way through a 45 mph construction zone by an Arizona state trooper. “You were speeding, and weaving across the fog line,” the trooper greeted me, before I could say anything. “The white line along the side of the road,” he said. “Your rear wheels touched it a couple of times,” he said, making sure to shine his light squarely in my blue eyes. Bad answer, I thought. He was picking on me. But I didn’t yet understand why. I didn’t know whether to laugh or cry. Everyone makes fun my four-cylinder 2003 Chevy – as too slow to get out of its own way. Now I was being accused of speeding with it. How was that possible? “Okay, I’m not going to write you up for speeding,” he said. He also wasn’t going to write me up for touching the ‘fog line’ – both of which he knew were bogus charges. But he wasn’t going to let me off, without teaching me a lesson for questioning him, his authority and his judgment. He cited me for failing to have a printed copy of my current insurance card – having it on an app on my smartphone apparently wasn’t good enough for him. He also didn’t like the report he got back on my Florida license. But he wasn’t going to run me in over that. At that point, he just wanted to get rid of me, and teach me a little lesson, for being cheeky. The court, if I want to fight any of this, he said, is in Colorado City, Arizona – which is probably 70-80 miles away, back up through Utah and out the road toward Kanab. If you’ve heard of Colorado City before you might know that its twin city just across the border in Utah is Hildale – two cities best known for their overwhelming polygamist populations. It’s fairly weird place that I usually steer clear of. The officer who cited me doesn’t actually live there himself. He lives in St. George, Utah – which I think is an even weirder deal. After handing me my citation, he zoomed off and was soon pulling someone else over. I couldn’t tell exactly what kind of vehicle they were driving. Something like a white van. That is the kids’ way of describing my little blue Chevy. It seems to be a popular truck with landscapers, construction workers and pool service guys. Now I know what it feels like to be profiled, I guess. Not good, amigo.